Chapter 13 bankruptcy is a bankruptcy that is a repayment plan with creditors where you pay a percentage back without interest (as opposed to debt counseling – you pay 100 % back with interest). Chapter 13 bankruptcy is different than a chapter 7 bankruptcy and has advantages and disadvantages. Everyone qualifies for a chapter 13 bankruptcy. You do not need to meet the means testing requirements that are in chapter 7 bankruptcy. Chapter 13 provides for the maximum flexibility to stop creditors and reorganize your financial problems. How much debt do I need to have to file for chapter 13 bankruptcy? The is no minimum debt to file for a chapter 13 bankruptcy. There is a maximum debt limit of less than $1,184,200 in secured debt (as of April 2016) and less than $394,725 in unsecured debts. If you exceed these limits you can file a chapter 11 bankruptcy. chapter 11 is basically a large chapter 13 bankruptcy. What assets can I keep in a chapter 13 bankruptcy? (1) The debtor’s house equity up to $23,675 per debtor. (2) The debtor’s motor vehicle (car, truck or motorcycle) up to $3,775 . (3) Household goods up to $12,625. (4) Jewelry up to $1,600. (5) Anything you want up to $11,850. (6) Tools up to $2,375. Unlike chapter 7 bankruptcy, if you exceed the exemptions, you can still keep your assets that you want. You just have to pay the value to your creditors over time. For example, if you are over your house exemption by 6,000.00 dollars, you can pay the trustee 100.00 dollars a month for 60 months (6,000.00 dollars) and keep your home. Your exemptions are provide for in the United States Bankruptcy Code. Can I keep my home and car and continue to make payments? Yes. In a chapter 13 bankruptcy you can keep you home and cars. Additionally, a chapter 13 bankruptcy allows you to make up payments that are delinquent and get caught up over time. This allows you to save your home and cars from creditors. Chapter 13 also allows you to save your home from foreclosure. What debts are discharged in a chapter 13 bankruptcy? A chapter 13 bankruptcy can discharge your unsecured debts including medical bills, credit card debt, law suits, repossessions, foreclosure deficiencies, pay day loans, and personal loans. Unlike a chapter 7, a chapter 13 can restructure your student loans and taxes and allows you to make up back payments for your home and car. What is the process to file chapter 13 bankruptcy? Filing a chapter 13 is similar to filing a chapter 7 bankruptcy. Call us to do an initial consultation over the phone. We will make an appointment with you. It takes about 45 minutes. We will get all the information and give you a list of documents that we will need to get your case filed. Once we are retained and we have the documents, we type up your petition and have you sign it. We electronically file your case with bankruptcy court. We will send you an email or hard letter with your case number and a date to meet with the bankruptcy trustee. We will go with you to your trustee meeting. After your trustee meeting, there will be a confirmation hear that you will not need to attend which approves your case. After your confirmation hearing, you will need to make payments for 36 to 60 months and pay tax refunds to the trustee. At the conclusion of your plan, you will receive a discharge. It’s just that easy. How much does it cost to file chapter 13 bankruptcy? It costs nothing to call our office and have an initial meeting. If you decide that you want to file chapter 13, we require as little as 600.00 dollars to cover the filing fee and initial work. After your plan is confirmed, the balance of the fee is paid through the plan. The court has provided a basic total fee of 3,200.00 for bankruptcy attorneys in West Michigan. The filing fee is 310.00 dollars that the court charges. How long does it take to file and complete a chapter 13 bankruptcy? A chapter 13 bankruptcy is typically between 36 and 60 months depending on the amount of your debt and if you are below or above the means testing. If you are below the means testing for income, you pay for 36 months. If you are above the means testing you are required to pay for 60 months. Under no circumstances do you pay back more than 100% of the claims in your case. For example, if you pay 200.00 dollars a month and you only owe 2,000.00 dollars, you would only pay for 10 months. How will chapter 13 bankruptcy effect my credit and future? When you are done with your chapter 13 bankruptcy, your credit should be at normal levels in about 24 months. This is dependent on how you use credit in the future after your bankruptcy. It is important that you actually use credit in the future to improve your score. Not using credit in the future will not improved your credit score. We also recommend getting a credit card with a low limit. Start using it to by gas and basics. Who can I talk to about chapter 13 bankruptcy? Our bankruptcy attorneys are available to speak with you about your different bankruptcy options immediately. Call us now 616-449-6636. 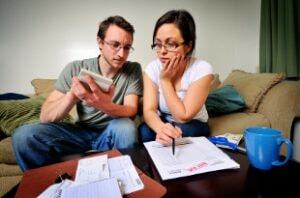 We some basic information from you, we can explain chapter 7, chapter 13, and other debt relief options. You have nothing to loose to hear about your options. How do I get started with my chapter 13 bankruptcy?